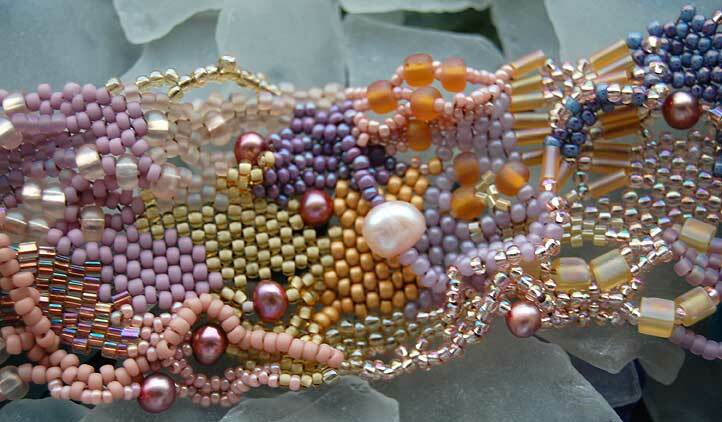 About 6 years ago, I started a free form peyote stitch amulet bag in luscious sea colors. Over the course of 4 years and a challenging time in my life, I worked on it on and off until it was finally finished. I loved the meditative feel of adding beads a little at a time and it mirrored for me the small positive steps I was taking in my life. Perhaps the healing memories of creating that amulet bag is one aspect of what drew me to the idea of the Beaded Journal Project years later. Recently, when I saw this bracelet created by Libby at Libzoid, it further awakened those memories. 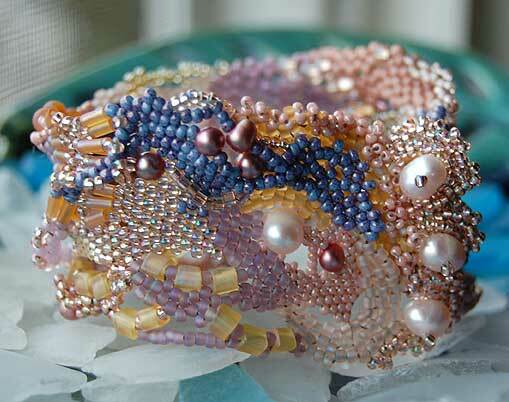 So, inspired by Libby’s creation and the sunrise colors in my December page, I created this free form bracelet. I call it “Awakenings”. 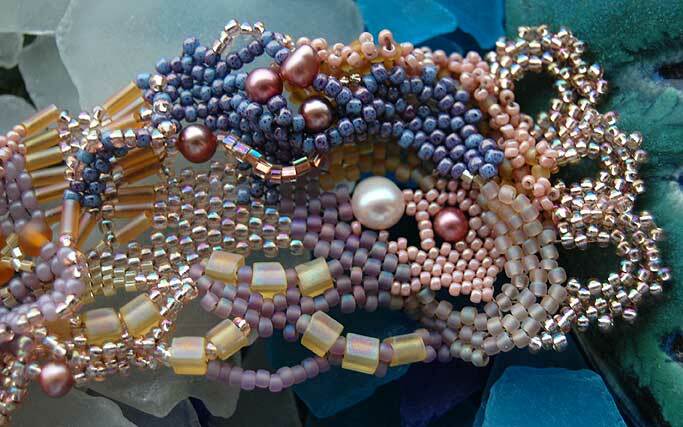 This entry was posted in Beads, Color, Creativity, Friends, Inspiration, Jewelry and tagged bead weaving, pearls, peyote stitch. Lovely, Karen! You did a fabulous job of capturing those vivid, yet delicate sunset colors so characteristic of winter and early spring. 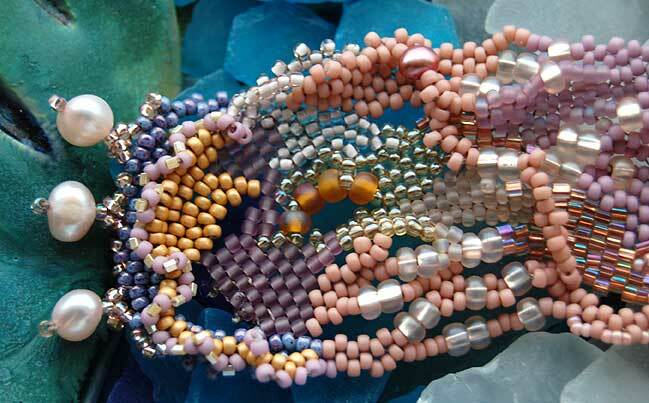 Now that I’m becoming comfortable with peyote stitch, I would like to try my hand at free-form…I’m guessing you picked your palette ahead of time, but did you plan the design too or just ‘let the beads lead you’?? Gorgeous bracelet Karen! I love the soft colors, very peaceful and serene. You’re making me want to finish the 2 other freeform bracelets I’ve got started. Thanks Dora. I picked my palette ahead of time. Actually, it was from the pile of beads I had on my table from creating my December journal page. I loved that color combination so much that I wanted to create something else with it. I didn’t plan the design at all. It just happened along the way. That’s what I love the most about free form. I’d love to see your creation! Thanks Libby. I loved creating this so much that I was almost sad when I was done. I can see how addicting it can be because now I want to start on another one, too. ooooh, I can’t wait to see your other bracelets. Thanks once again for your inspiration! The old saw that “great minds think alike” seems to be at work here — I have a freeform peyote necklace in progress, too. Your color palette is so serene and beautiful! Thanks Kathy! ooooh, a free form necklace. What a wonderful idea. I’m looking forward to seeing it! This is very gorgeous. Love everything about it. Your bracelet is gorgeous! Thanks for sharing. Thanks Acey and Frivolitea, I had so much fun and insight with this! Oh I love the peyote stitch…haven’t done it in a long while. Your piece is really beautiful. Oh, it is GORGEOUS! I agree! Thanks Alma, it was so much fun to make! I love the colors of your bracelet. So feminine — I would never not want to wear something like this — as a matter of fact, most women I know would love to! I need to know something, though, is this sort of thing — beaded jewelry, becoming dated at all? I lived in a lg. city all of my adult life,and am now back in my small hometown due to serious illness, which prevents me from working. I don’t know treadds and styles as I once did. Can anyone contribute to my ponderings? Thanks Kim for commenting on my bracelet. I don’t think that beaded jewelry is becoming dated at all. On the contrary. I’m sorry to hear of your illness and wish you well. I hope you’re well now. This is a truly lovely piece, and stands as art and looks quite wearable too. I’m featuring it in my blog writing on Feeform Peyote, linking to this page, providing your name, and showing a picture. It’s beautiful. Thank you so much, Malia, for your visit and for your kind comments about my free-form bracelet! I so appreciate the link!